As I've mentioned before, in Delh, you are literally falling over the past, with tombs, and religious buildings, remains of walls, gateways and the like spied everywhere. Here is just such an example! This is a Tomb with Chatri, meaning 'umbrella' or 'canopy'. Chatris are ornate, domed buildings which can either be purely decorative or marking an entrance to a tomb or site of a cremation. This was spotted through the gates of Jawaharlal Nehru Stadium on its Northern side. Sadly the gates were locked, so I couldn't get closer. I had seen on instagram a couple of photos so set out to find today failing at the last step. 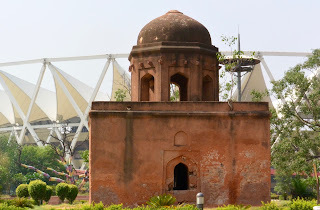 When the stadium was built in 1982 this and 2 other tombs, I've since learnt, were preserved. This tomb is early Mughal, rectangular in shape, unadorned and quite plain, with a vaulted ceiling. The other two tombs can be found further south on this large complex. A 14th century small plain tomb is near gates 9 and 10 and, sitting next to the running track, is apparently an interesting 16 sided tomb, believed to be from the 16th century. Each side having a locked door in a niche leading to the burial chamber and on the roof sits 3 cenotaphs upon a raised platform. I have been unable to find any information as to who these belong too. Although Im sure my driver thinks I'm mad, getting him to drive me around hunting for these little gems, I really must go back another time when the gates are open to find the missing 2!